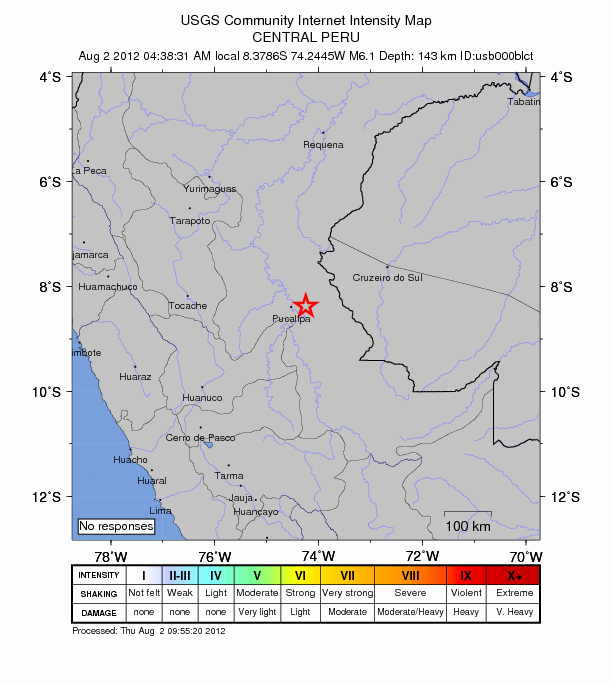 Very strong but luckily deep earthquake struck Peru on August 2, 2012 at 9:38 UTC according to USGS. Epicenter was located 34 km (21 miles) E of Pucallpa, Peru at 8.379°S, 74.245°W. Recorded depth was 143.3 km (89.0 miles). EMSC is reporting magnitude 5.8 and depth od 135 km. This earthquake can have a low humanitarian impact based on the magnitude and the affected population and their vulnerability. There are 360000 people within 100km radius.